It is difficult to assess the effectiveness of community college initiatives serving men of color when there is a lack of understanding of the nature of the programming taking place. 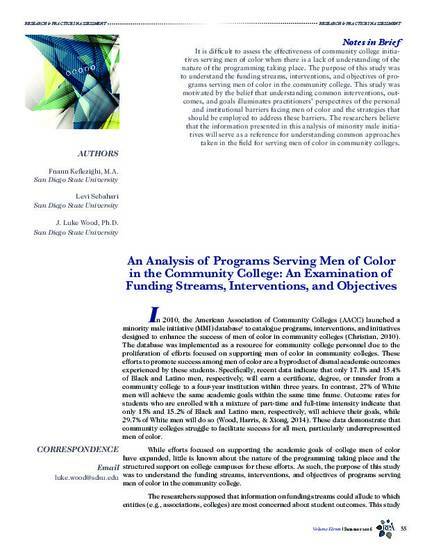 The purpose of this study was to understand the funding streams, interventions, and objectives of programs serving men of color in the community college. This study was motivated by the belief that understanding common interventions, outcomes, and goals illuminates practitioners’ perspectives of the personal and institutional barriers facing men of color and the strategies that should be employed to address these barriers. The researchers believe that the information presented in this analysis of minority male initiatives will serve as a reference for understanding common approaches taken in the field for serving men of color in community colleges.